With an enviable setting on the beachfront of Santa Monica and radiating historic elegance, Casa Del Mar is the perfect location for vintage-inspired weddings. Its Renaissance Revival architecture dates to the 1920s when Santa Monica was a playground for Los Angeles’ rich and famous, with lavish beach clubs lining the sand. While Casa Del Mar closed down during World War II, it has been restored to its former magnificence to exude the glamor and style of days gone by, while at the same time featuring contemporary amenities that guests have come to expect. It features Mediterranean elements in its red-tiled roof and iron balconies, with palm trees lining its beachfront promenade. A grand rotunda at its entrance features sweeping staircases with mosaic tiling and an impressive wrought-iron chandelier, while soft pastel tones and marine blue adorn the walls. But it’s the ocean vistas that are the cherry on the top and provide a dream backdrop to your special day. Both indoor and outdoor spaces are available for your wedding at Casa Del Mar, including the ocean-facing Palm Terrace which can seat up to 80, the intimate Crimson Room and its adjacent Crimson Living Room, as well as the elegant Indigo Room and Board Room. But it’s the Colonnade Ballroom that is the highlight for Casa Del Mar weddings, with the capacity for up to 320 guests for lavish formal receptions. Venetian glass chandeliers hang from the sculpted ceiling, while silk draperies frame the windows which offer incredible sunsets over the Pacific Ocean. Adjacent spaces such as the Colonnade Foyer and Colonnade Terrace can be incorporated into the setup, offering refreshing ocean breezes, or separated to suit the size of your wedding event. A wedding planner or coordinator selected from a list of those approved by Casa Del Mar must be hired to help execute your dream wedding day, while vendors can be select from their approved list of professionals. Catering is provided on-site by their outstanding culinary team, with discounts for catering packages with more than 50 wedding guests. All tables, chairs, linen, china and glassware is provided by Casa Del Mar, reducing your planning logistics significantly and allowing you to focus on more important things. Complimentary lodgings are included in Casa Del Mar wedding packages for the couple on the night of their special day, featuring elegant furnishings and modern conveniences. Rooms for guests can also be booked in blocks of at least ten, while indulgent penthouse suites are available for a surcharge. Casa Del Mar is situated just a stone’s throw from the historic Santa Monica Pier and lively 3rd Street Promenade, as well as the cliff-top gardens and walking trails of Pacific Palisades. 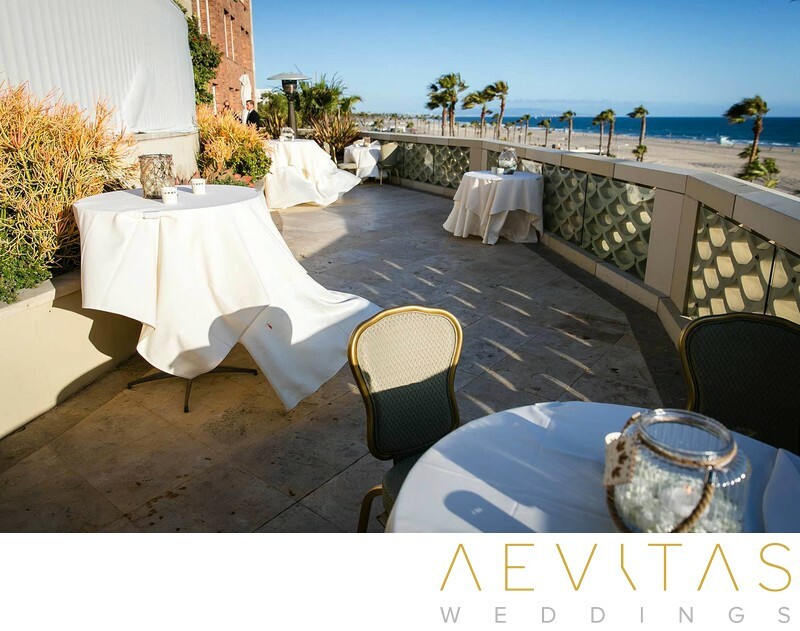 The quality of Casa del Mar’s craftsmanship, nostalgic elegance and breathtaking beachfront setting in Santa Monica make it one of Southern California’s most distinguished wedding venues.